The 302F is a small, basic, simple to use Plural Component Spray machine for Solvent Free Passive Fire Protection Epoxy Materials. 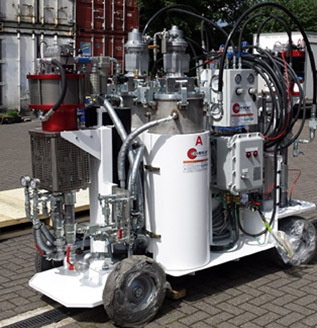 This spray machine is suited to general applications, patch and repair spray with added use as a batch dispense unit for premix hand applications of Fireproofing Coatings mounted on a four wheel cart. The system is compact and mobile and can replace Single Pack Application where solvent addition would have been necessary. The CoverCat 302F is capable of high pressure delivery of 6.0 litres/min (1.5gpm) at 20 cycles/min. Hose lengths up to 30m can be used with a standard 5 meter whip hose also to a total of 35metres. It is possible to extend to 45metres with additional equipment. Maximum elevation is recommended at 20 metres between machine and spray gun.